What do we mean by an Indefinite Integral? Indefinite integral is an important component of integral calculus. It lays the groundwork for definite integral. Students are advised to practice as many problems as possible as only practice can help in achieving perfection in indefinite integrals. (1) The first type of problems are those in which the derivative of a function, or its rate of change, or the slope of its graph, is known and we want to find the function. We are therefore required to reverse the process of differentiation. This reverse process is known as anti-differentiation and it is often termed as finding of a primitive function or finding an indefinite integral. (2) The second type leads to the definition of the definite integral. Definite integrals are used for finding area, volume, centre of gravity, moment of inertia, work done by a force and various such applications. This integral  is  called  an  indefinite  integral  because  its  value  is  not  fully determined until the end points are specified. This ambiguity is dealt with by the addition of the constant C at the end. This constant of integration is added to the end because there are, in fact, an infinite number of solutions to the integral. The topic holds great importance from examination point of view and is widely used in modern sciences as well as in engineering entrance examinations. They account to many lengthy numericals and key derivations. Indefinite integration is also termed as antidifferentiation and as the name suggests, it is the reverse process of differentiation. where f(x) is called the integrand, x is called the integration variable and ‘c’ is the constant of integration. 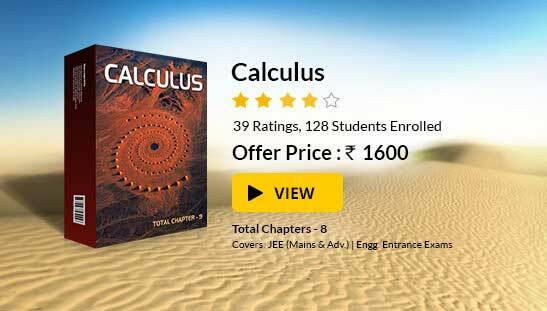 Various basic and important formulae used in indefinite integrals have been discussed in the coming sections. If ∫ f(x) dx = g(x) + c, then ∫ f(ax + b) dx = 1/a g(ax + b) + c, where a and b are constants such that a ≠ 0. Constant is an important component in indefinite integration. 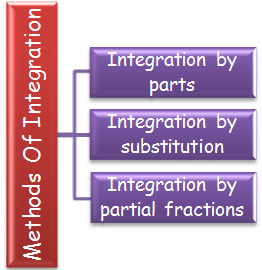 At times, questions on integration can be solved directly by application of direct formulae. But, usually the questions asked in competitive examinations are not very simple and can’t be solved by direct application of formulae. If the integrand is not a derivative of a known function, then the corresponding integrals cannot be found directly. In order to find the integrals of complex problems, generally three rules of integration are used. (2) ?Integration by substitution or by change of the independent variable. (3) Integration by partial fractions. If both of the functions are directly integrable then the first function is chosen in such a way that the derivative of the function thus obtained under integral sign is easily integrable. Usually we use the following preference order for the first function. This rule is called as ILATE which states that the inverse function should be assumed as the first function while performing integration. Hence, the functions are to be assumed in the order from left to right depending on the type of functions involved. Various other cases have been discussed in detail in the later sections. Besides direct and indirect methods, sometimes questions can also be solved by some standard substitutions. The direct and indirect substitutions have been discussed in detail in the section on substitution method. We list here some of the standard substitutions. If both √a + x, √a – x,  are present, then put x = a cos θ. For the type (√x2 + a2 ± x)n or (x ± √x2 – a2)n, put the expression within the bracket = t.
Evaluate ∫ x3 tan–1 x4/(1 + x8) dx. = 1/8 (tan–1 x4)2 + A. If P(x) and Q(x) are two polynomials, then P(x)/Q(x) is called a rational function. It may further be classified as a proper rational function or an improper rational function. If deg P(x) < deg Q(x), then it is called a proper rational function. If deg P(x) ≥ deg Q(x), then it is called an improper rational function. If P(x)/Q(x) is an improper rational function then we divide P(x) by Q(x) so as to express the rational function P(x)/Q(x) in the form a(x) + b(x)/Q(x), where a(x) and b(x) are polynomials such that degree of b(x) is less than that of Q(x). where A1, A2, ..., Ak, M1, M2, ......, Mr, N1, N2, ...... ,Nr are real constants to be determined. These are determined by reducing both sides of the above identity to integral form and equating the coefficients of equal powers of x, which gives a system of linear equations in the coefficient. (This method is called the method of comparison of coefficients). The constants can also be obtained by substituting suitably chosen numerical values of x in both sides of the identity. Evaluate ∫ 1/sin x (2 + cos x – 2 sinx) dx. = 1/3 In |tan x/2| + 5/3 |tan x/2 –3| – ln | tan x/2 – 1 | + c.
Universal substitution often leads to very cumbersome calculations. Indicated below are those cases where the aim can be achieved with the aid of simpler substitutions. Various other cases of substitution in case of trigonometric functions have been discussed in detail in the later sections. Evaluate ∫ √sin x cos x dx. ∫ k f(x) dx = k ∫ f(x) dx, where k is any number. Hence, a constant can be taken out of the integral sign. ∫ - f(x) dx = - ∫ f(x), this actually follows from the above property only for k = -1. ∫ (f(x) ± g(x)) dx = ∫ f(x) dx ±  ∫ g(x)) dx, this property can be extended to any number of functions. The same cannot be said for multiplication and division of functions i.e. (a) inverse function as the first function and logarithmic as the second. (b) the functions can be chosen in any order. (c) logarithmic function should be chosen as the first and inverse as the second. For getting an idea of the type of questions asked, refer the previous year papers.? You may wish to refer definite integral.